The phone crackled one early morning in Jan Tober's life: "This is Benny Goodman," the voice said. "You come very highly recommended and I want to hire you, but I've never heard you sing. Can you hum something for me?" Such is the stuff that fairy tales are made of - at least for a girl jazz singer! But this call was simply one of many that had already marked an amazing career for Jan. While still a teenager she replaced Ann Richards as vocalist for the Stan Kenton Band*, and went on to be featured on the bandstand and on Stan's regular TV show from the Rendezvous Ball Room at Balboa Island. From there she went on the road for two years with the Les Elgart orchestra, then two tours with Si Zentner and the Four Freshmen. Along the way she also did shows with Rowan & Martin, Bob Hope and many more. Then Fred Astaire called her to represent his new label! When she got tired of the road, Jan settled down in Del Mar, California and proceeded to do a local 90 minute daily TV show for over two years. It was at this time she was contacted by Goodman's agent - and turned him down! When Benny called personally, however, she accepted and was back on the road again. This time with the King of Swing. You would think that for the vocalist selected in 1980 to represent the United States in The French International Music Festival in Cannes France, Jan would have no time for anything but her music. In fact she is also an extraordinary design artist, with paintings, clothing and jewelry for sale in galleries and boutiques in several states... not to mention the Kryon seminars! Jan has been an active Metaphysician all of her life and using this, plus her profound experience in music, she now concentrates her efforts in the goal of changing lives through sound and color. 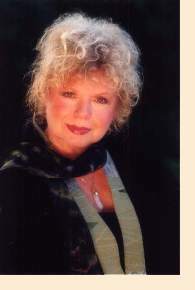 Her "Sound/Color" workshops are a featured part of the Kryon seminars worldwide, as well as her guided meditations. She has also released several related musical and artistic products that are listed on this web site (see below). Besides traveling the world with the Kryon work, Jan has also presented three time at the United Nations in New York City.